Kay H. Bransford is a recognized expert in how to collect, manage, and organize personal information. Forbes, The Dr. Oz Show, and Huffington Post are a few of the media outlets that have turned to Kay to understand, and educate families, caregivers, and retirees on, this issue. The Book to go in discussion on CarryonHarry Talk Show "MemoryBanc Your Workbook For Organizing Life"
Nearly half of adults over forty can expect to face a short-term disability before they reach sixty-five and 70 percent of American’s over sixty-five will need three years of care and support. MemoryBanc makes it easy to document accounts, usernames, and medical history so they can be easily found or shared should they ever be needed by a spouse or loved one. It also helps couples that divide and conquer stay on the same page and gives individuals a way to easily hand over important information should it ever be needed. With the help of MemoryBanc, readers no longer have to store their information in their heads, on their phones, in a file, or under a keyboardâ€•they now have one place that captures it all. 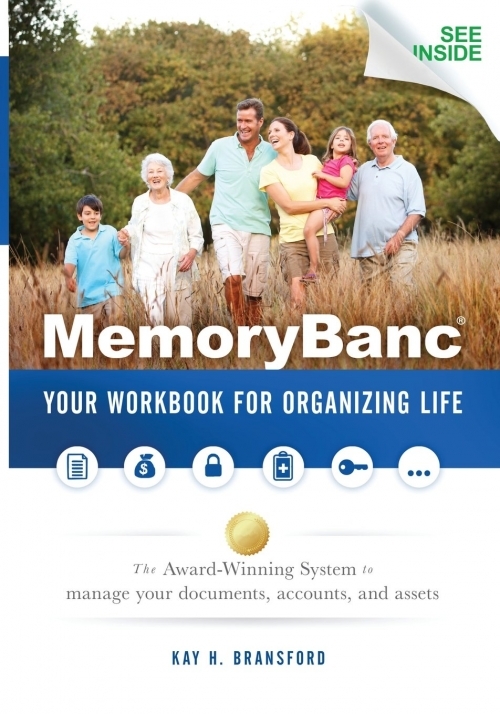 Find out how easily it is to secure your assets with MemoryBanc Your Workbook For Organizing Life. Kay's parents had done everything the estate lawyer, financial and insurance advisor recommended, but when Kay needed to step in and help she realized that she didn't have a lot of information she needed to be a good advocate for them. While she held their durable power of attorney, not every institution recognized it, and in some cases, it took weeks to months to have it recognized so she could help her parents pay their bills and manage their household. As their caregiver, she also worked to create a record of their medications and personal and family medical history. Kay was raising two children, and both she and her husband held full-time jobs. Managing tasks for her parents was overwhelming, so she created a binder-based system to document, organize, and support them. Many friends and colleagues knew what Kay was going through, and when they started to face similar situations and asked her for a copy of her workbook, MemoryBanc was born. Kay expected that caregivers would be her biggest clients but instead found that most of her clients were between 40 and 60 years old and purchased the workbook to organize themselves. Today, the tool is primarily used by couples as a way to share information about the tasks they have been dividing and conquering for years. Not only does it offer a simple way to track and organize a household, but it also allows couples to work together in managing shared lives. AARP Foundation named MemoryBanc an "Older-Adult Focused Innovation" and MemoryBanc topped the Total Brain Health 2014 Gift Guide.